Haricots Verts: How to Cook French Green Beans? French green beans are typically in season from summer to early fall so we have a bit more time to enjoy them. Also called “haricots verts” or string beans, French green beans, are a delicious healthy side dish you can serve in a variety of ways. It also adds a vibrant splash of green to composed salads. Haricots verts simply means green (vert) beans (haricots) in French and they always look so much more appetizing when they keep their healthy green coat. 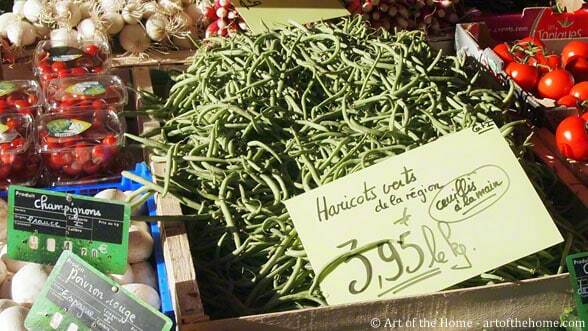 Did you know the tip on how to cook French green beans so they keep their vibrant green color? This tip on how to cook French green beans works not only for thin French “haricots verts” but any green beans you find at the supermarket. So check below for Art of the Home tip on how to cook French green beans and keep the “green” in your green beans! Cook them in a large pot of boiling water. First bring water to a boil then add a few good pinches of sea salt and cook uncovered for about 10 to 20 minutes – more of less depending on how crispy (or soft) you like them and how thin they are. It is important you cook your green beans without a lid so you don’t trap the acid released by the green beans during cooking. These acids attach to the chlorophyll inside the green beans, changing its color to a dull green grayish color so by cooking uncovered you are minimizing the change of color. An additional step you can take to lock in that gorgeous and healthy green color is to drain your green beans and then drop them for a few seconds in an ice bath. It will stop the cooking and fix the chlorophyll which gives green beans their attractive green color. We recommend doing that especially when you are serving your green beans in a salad (a salade nicoise for example) — it will also speed up the cooling period. We don’t take that extra step however when we are simply serving them dotted with butter and chopped parsley for a quick and healthy side dish. Et voilà!